Nice people and got early check in even though they were really busy. Disappointed that both restaurants were closed at the same time. Great staff! Lobby a little dated. Great location. The hotel was great except that the room strongly smelled of cigarette smoke. Great location for anything downtown Madison. Friendly check in staff. Will be staying here again in September. The ceiling was dirty and the shower handrail was broken. The bed was comfortable. Staff was very friendly. Super comfy beds! Very clean. Surrounded by Lake Monona and Lake Mendota, Madison is quite the popular place for those who love being outside. Every season in the second largest city in Wisconsin is a wonderful experience. The many outdoor sights such as Memorial Union Terrace and Olbrich Botanical Gardens, parks such as Tenney Park and Vilas Park, and over 200 miles of biking and hiking trails are what separate Madison from other cities in the area. There are several areas in Madison which are worth exploring. Downtown Madison, for example, lies right between the beautiful lakes. In less than 30 minutes, you can walk from Lake Mendota to Lake Monona. You will also find yourself close to the Madison State Capital. This remarkable building is not only quite the sight on the outside but also its inside is rather unique. Downtown Madison is where many business hotels are located. This is not just an ideal location because of its central position but also because the University and other college-related facilities can be found nearby. Furthermore, Downtown Madison is what you would call the city center. Museums such as the Wisconsin Historical Museum, Madison Children’s Museum, and the Wisconsin Veterans Museum are just a few examples of what the area has to offer. West Madison is another popular area for hotels. As it is located a bit further away from the city center, it makes it ideal to explore the area surrounding Madison. At the West Towne MallHenry Vilas Zoo is not too far from the West Madison Area. South Madison is the place to be for venturing out in nature. Winnequah Park and the Aldo Leopold Nature Center are just two examples of attractions that are great for hiking or exploring cycling routes. A great place to unwind after being out and about for a day is the Alliant Energy Center, which is also located in South Madison. The Alliant Energy Center is a large venue where all kinds of events are hosted. Staying in South Madison is perfect if you are in town to particularly visit one of the events that are held there. Madison has about forty 3, 4 to 5 star hotels across the different areas. If you would like to be pampered on your holiday then stay at one of the luxurious 4 star hotels in Madinson. These hotels offer remarkable views, spacious rooms, spa services with different treatment rooms, and, of course, premium bedding and several bars and restaurants on-site. Alternatively, Madison’s 3 star hotels offer great rooms with comfortable beds and breakfast options on-site in another price range. The business hotels mentioned earlier are available as both 3- and 4 star hotels. Not too far from Madison, you will find Dane County Regional Airport. If you have an early flight and prefer staying near the airport, you are in luck. 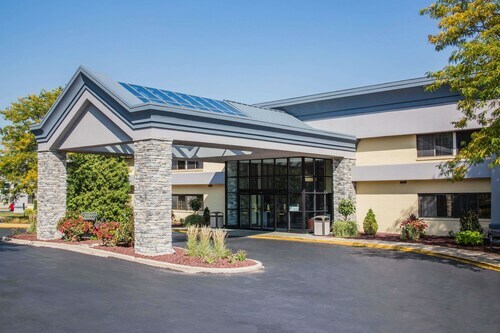 There is a selection of hotels in East Madison that are just a short drive away from your next flight and will offer you a pleasant stay during your short visit. Everything was just as it should be, and the young lady checking in was very helpful.